To design a cheap and effective method of traveling with full moonclips, and avoid having to clip/de-clip ammunition just for packing. To have the capability of storing rounds fully clipped in a manner acceptable to TSA for air travel. To prevent movement of clipped ammunition from damaging clips and rounds during transport. 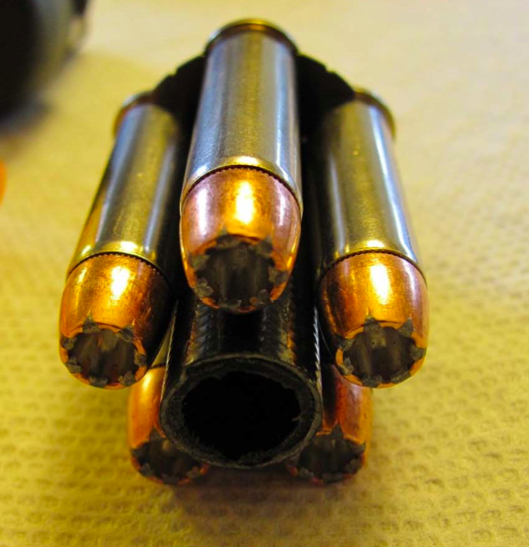 For this purpose, the Del Fatti PMCs or the fabricated spacer insert (see below) are necessary to prevent the rounds from moving around during travel. Using plier, remove the metal pocket clip from the plastic Sharpie tip cap. leaving the top 1.5 inches for 38 Spl ambition or top 1.6 inches for 357 Magnum ammunition. tape down, and trim and roll over any ends. If you are using x1 or x2 Del Fatti PMCs in a single bottle. 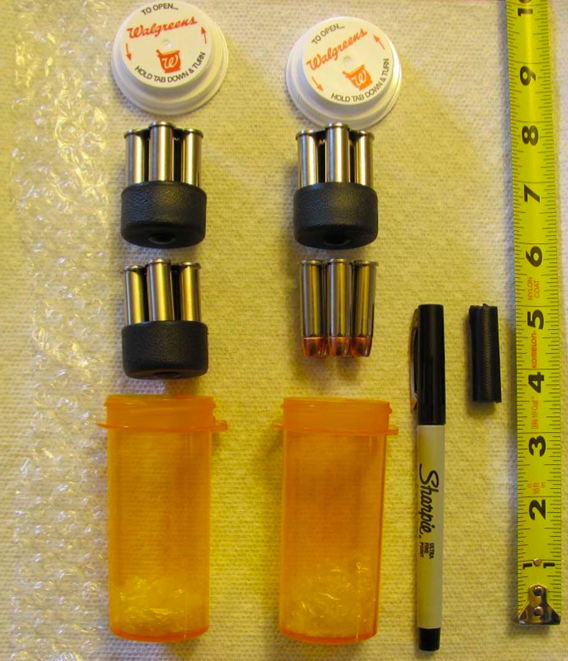 I will typically travel with x2 pill bottles and x3 PMC’d clips, leaving the 4th moonclip assembly for immediate insertion into the J‐frame/SP101 cylinder. It is this 4th assembly that will require the insert spacer. You will want enough bubble wrap in the bottom of the pill bottle so that when all ammunition is in the bottle it protrudes enough from the bottle so that a small amount of pressure is needed to attach the pill bottle cap. This prevents the ammunition from rattling around during transport. If you are using x2 PMC’d clips in a bottle, the spacer insert is not used. Insert both moonclip assemblies PMC side down. If you are using only a single PMC’d clip in a bottle, then the spacer insert is necessary. When using the spacer insert, insert the narrower end into the moonclip assembly between the rounds. Insert the non‐PMC’d moonclip assembly first, spacer insert‐side down, and then insert the PMC’d assembly on top of that – PMC’d side down. This protects both the PMC and the rounds.